It's typically best to bring on all of your leaders once you know that you'll be using GroupVitals - 100%. It's also a good idea during your trial period to invite a handful for close leaders to try GroupVitals out and give you feedback. Be sure that all of your active group have been added. Check that each leader has an email address on file. Assign each leader to their group (and be sure to not check to notify them by email). Cast vision for GroupVitals to your leaders. Some churches will do this at an upcoming leader meeting or training or will meet with their leaders for a couple of weekends in-between services. If you can't do this in person, then it's best to put together a well written email and/or video, presenting GroupVitals. You can use ours here. Keep the video short and sweet (5 min or less) and if the email is over a hundred words, I suggest putting it into a slideshow, then do a screen recording and narrate through the slideshow if recording a video isn't an option. Keeping people engaged will be key. A tip: Hold something for the leader to look forward to hearing about until the end of the video, as an incentive to watch it (or read through your email). It's important to connect using GroupVitals to your ministry and church's bigger, deeper vision. Explaining the "Why" will be powerful. Here's a must-watch Ted Talk titled "Start With Why" to best inspire and motivate leaders to use GroupVitals and continue to grow as a leader. Talk about all the benefits to them as a leader. Take more control / ownership of their group roster. Send out email communications to the entire group. Easy to take attendance via email or text - no login required and takes less than 2 minutes. Delegate administrative responsibilities to a group member aka "sharing the load." Typically much more user friendly and easier to use than your church management software. Tell them what they need to do and what to expect. Some churches who host this even in person will have tablets and computers available to have their leaders create their account on the spot. Tip: Take pictures of your leaders with a cell phone and add it to their group profile. 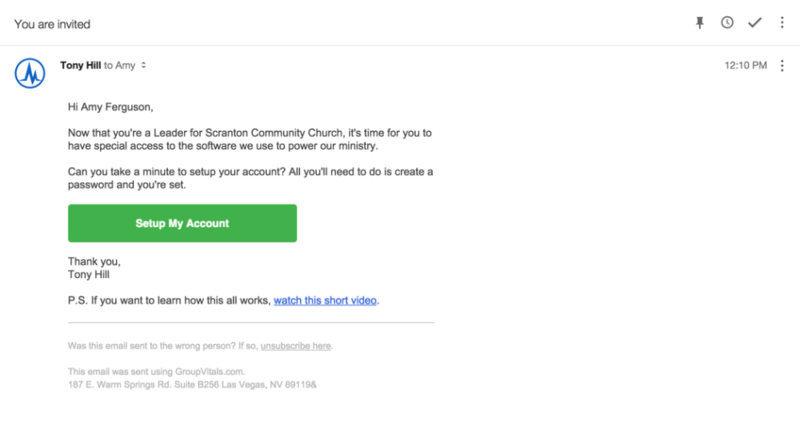 They should expect an email from a church staff member that contains a link to click on to setup their account. All they have to do is create a password and they are in. Add a link on your church's website where leaders can be directed to the GroupVitals login page, which is the same as yours. Or, just be sure to follow-up with them from time to time reminding them where they can login, as some tend to forget or never bookmark the link. Inviting your leaders to create a GroupVitals account is easy. In the top navigation, click People > Leaders (or whatever you call people who oversee groups). From your leaders page, click on the sub-menu (3 vertical dots) near the top-right, next to the Sort-by button. In the dropdown menu, click "Send Invite to Leaders." If you want, you can adjust which leaders get an invite by using the search filters first, then come back to the leader invite window to see an updated recipient list. You can also navigate to each leader's personal profile. In the info box to the left, under their name, you'll see a link titled "No Account - Send User Invitation" - when you click this link, it will fire off an email invitation. Keep an eye on which leaders have created their account and which ones haven't by going to the Leaders page. Using the search filters, you can select to see leaders who have created an account and who haven't created an account yet.